OTTAWA -- The opposition parties are balking at the federal government's attempt to fast-track its wide-spanning national security legislation into committee, bypassing second reading debate. On Monday morning Public Safety Minister Ralph Goodale put forward the motion to have the Liberal’s national security and oversight reforms -- Bill C-59, the National Security Act, 2017 -- moved directly into the House Public Safety and National Security Committee for study, without second reading debate. NDP MP Matthew Dubé quickly took issue with the move, saying that by attempting to skip second reading debate, the Liberals would be taking advantage of a "loophole" in a newly introduced rule that allows omnibus bills to be split into separate parts for votes. As part of a package of House of Commons Standing Order changes passed in the spring, the Speaker of the House of Commons now has the power to divide omnibus bills -- bills that have many different parts and make changes to multiple pieces of legislation -- into separate parts for votes at second and third reading. House Speaker Geoff Regan made history in ruling for the first time in the last sitting week, that the Liberal’s latest budget implementation bill fit that category, ordering it to be divided for voting. In the NDP’s summation, Bill C-59 is an omnibus legislation, and Dubé argued that the Liberals wanting to skip second reading would prevent the bill from getting split up at that stage. "Attempting to do through the back door what would be forbidden through the front door," as Dubé put it. 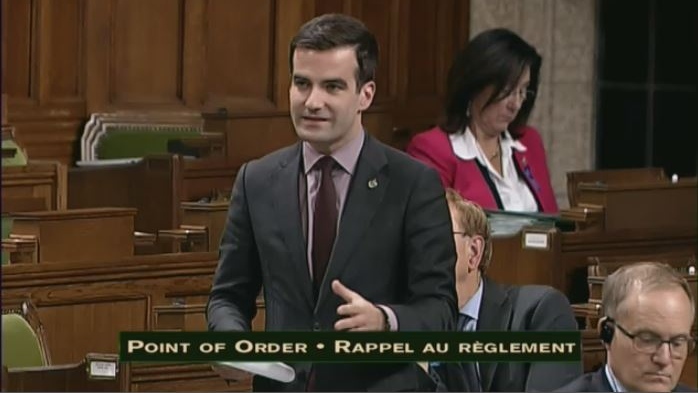 Monday afternoon, Dubé rose on a point of order, asking that the Speaker use this new rule -- implemented by the government -- to split Bill C-59, to no avail. After taking Dubé’s ask under consideration, Regan said indeed, he was not able to apply the omnibus bill splitting rule at this point, but would be able to consider it once the bill is back before the House for third reading. This means the motion to fast-track Bill C-59 in one piece remains in place. Bill C-59 was introduced June 20, and had been sitting on the order paper awaiting debate ever since. MPs have spent the day debating whether to allow the bill to skip its first parliamentary leg without scrutiny all day. The 150-page piece of legislation creates new policy, amends a number of other pieces of law, and makes changes to the previous Conservative government’s contentious national security legislation Bill C-51. The government says the bill is focused on balancing Canada’s spy powers with the civil liberties of its citizens. During debate, Conservative MP Glen Motz questioned whether fast tracking the bill is just about Canadian’s security, or is a political move. "I’m left to wonder, is this just a disguised time allocation move? Or is this maneuver just a ploy to avoid multiple votes at second reading? Or both?" Motz said. 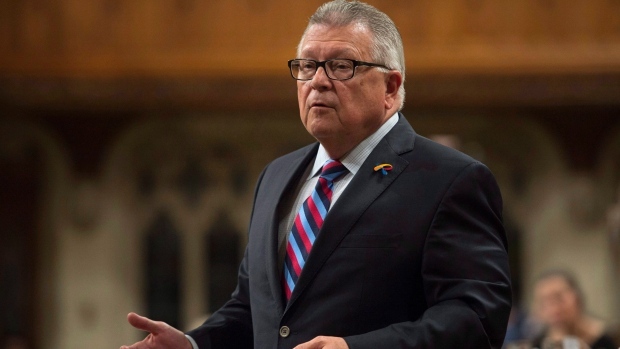 In defence of his proposal earlier on, Goodale said fast tracking it would give MPs "maximum flexibility" to study the bill, and argued in favour of it staying in one piece. "We are sending it to committee before second reading to ensure the examination of this bill is as thorough as possible," said Goodale. "This is comprehensive change and it touches on a variety of elements. They all hang together in a coherent way and they need to be considered together." NDP MP Murray Rankin said this is the first time this Parliament that the government has tried to have a bill evade the second reading debate stage. The motion could come to a vote Tuesday. NDP MP Matthew Dubé in the House of Commons on Monday, Nov. 20, 2017.